Beyond Fiction and Harvest Pictures are delighted to announce that its film Obey will celebrate its UK Premiere at the Edinburgh International Film Festival (EIFF) on 27th June 2018. It will be in competition for the Michael Powell Award for Best British Feature Film. 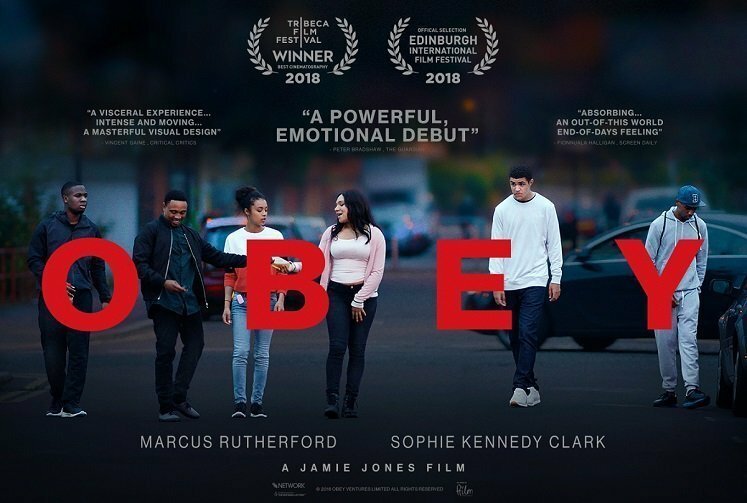 Obey won Best Cinematography at the Tribeca Film Festival where it featured in the International Narrative Competition category for its World Premiere among rave reviews, including: ‘a powerful, emotional debut’ from The Guardian’s Peter Bradshaw; ‘Absorbing…an out of this world, end-of-days feeling’ (Screen Daily) and ‘A visceral experience…intense and moving…a masterful visual design’ (Critical Critics). Obey is about Leon, a 19-year-old boy with an alcoholic mother who has grown up in and out of care. Introducing Marcus Rutherford as Leon, who plays the film’s central character, Obey also stars Sophie Kennedy Clark (Philomena, Nymphomaniac, Black Mirror) as Twiggy, and T’Nia Miller (Wagstaffe, Stud Life, Marcella, Guilt) as Leon’s mother. Obey is raw and uncompromising and set against the backdrop of the 2011 London riots. It is the directorial debut feature from Jamie Jones, whose award-winning short film The Nest starring Vicky McClure was recently selected for Clermont-Ferrand International Short Film Festival and Tampere Film Festival 2017. Produced by Emily Jones of Beyond Fiction and Ross Williams of Harvest Pictures, executive produced by John Giwa-Amu (The Party, The Silent Storm, The Machine) of Red & Black Films, with sound design by Ben Baird (Lady Macbeth, The Levelling) and cinematography by Albert Salas. Obey will have its UK Premiere at the Edinburgh International Film Festival 2018 in the Best of British section and will be in Competition for the Michael Powell Award for Best British Feature Film. Blade! Half-Mortal, Half-Vampire! Still Sharp?